I made these tasty little delights for Superbowl Sunday. The recipe comes from Juli Bauer at paleOMG. 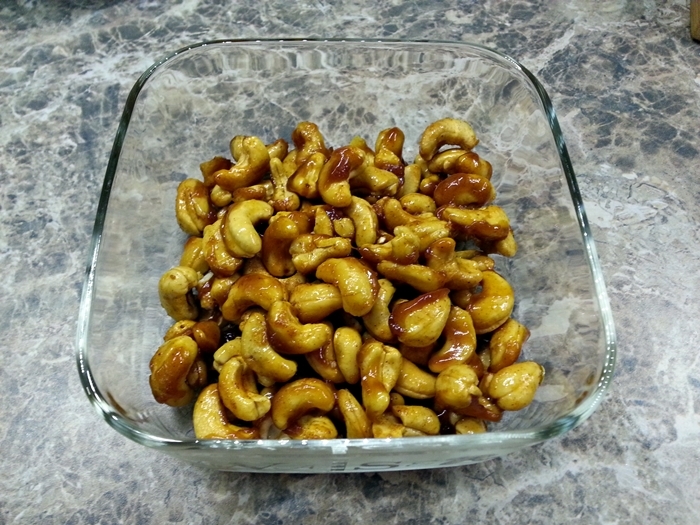 She posted her Smoky and Spicy Candied Cashews in January, just in time for the Superbowl. I didn’t have enough cashews to follow the recipe exactly, so I winged it and I’m fairly certain I screwed up the process a bit so they came out a bit sticky. BUT, they were yummy and I learned from my mistake for next time. Whisk together honey, coconut oil, smoked paprika, cayenne pepper, and salt in a medium bowl. Add the cashews to the bowl and coat in the mixture. 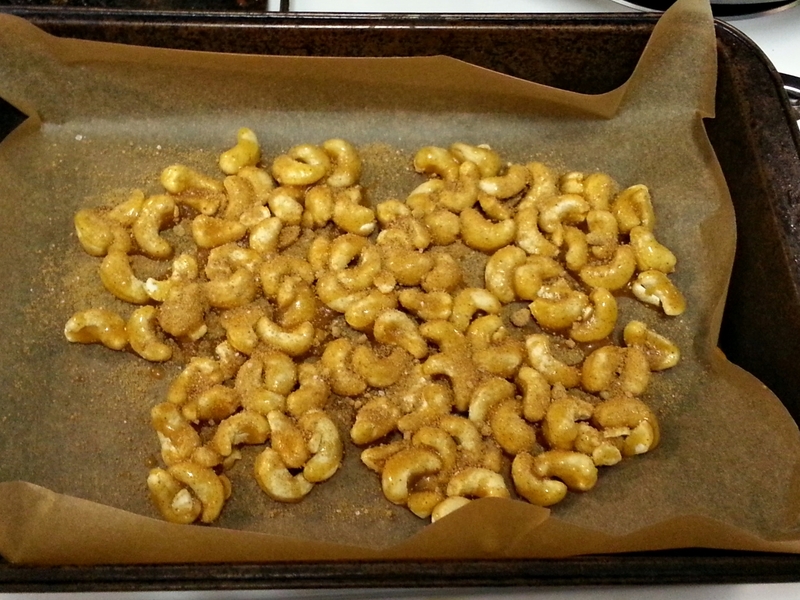 Pour the cashews on the baking sheet and spread out. In a small bowl, mix together coconut sugar, smoked paprika, cayenne pepper, and salt. Sprinkle the crystal mixture on top of the nuts. Bake for 15 minutes, tossing the nuts every 5 minutes to ensure they cooked evenly. Remove from oven, slide the parchment paper onto a cooling rack and let cool completely. Once the nuts have cooled, break apart the pieces that have stuck together. I only had 1.5 cups of cashews. So I tried to reduce all the other ingredients but it was not an exact science. Mixing the nuts in the bowl with the coconut oil, honey, paprika, cayenne, and salt went fine. I laid them out on the parchment paper below and dusted them with the dry mix of sugar and spices. So. Lesson learned. Next time I make these, I’m going to have 2 cups of cashews and I’m going to follow the measurements exactly, and I’m NOT going to worry when the nuts don’t look quite right at the beginning of the baking. I have faith that after 15 minutes they will look more like the finished product without tossing oodles of extra sugar on them.